SIME Darby Property Bhd, the property arm of Sime Darby Bhd, said its ongoing Parade of Homes promotion has sold more than RM800 million worth of properties, which is by far its most successful Parade of Home instalment. During the first two instalments, the company sold RM450 million worth of properties combined. "Sales have been very good, given the current economic situation," said its managing director Datuk Tunku Putra Badlishah Annuar in Kuala Lumpur yesterday. The promotion ends in the middle of this month. Badlishah was speaking to reporters after the launch of Sime Darby's "Switch!" campaign, an energy-efficiency initiative targeted at more than 10,000 households in townships developed by the company in Shah Alam, Petaling Jaya, Subang Jaya and Klang. 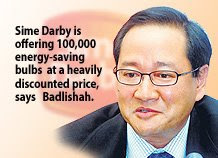 In the first phase, Sime Darby is offering 100,000 energy-savings bulbs at a heavily discounted price. Each household in Sime Darby townships like UEP Subang Jaya/ USJ Heights, Bandar Bukit Raja, Ara Damansara, Denai Alam, Bukit Jelutong and Putra Heights can purchase a box of eight energy-saving light bulbs at RM50 (retail price: about RM160). "We want to help Malaysians become conscious of the energy choices they make. If we can switch people to the many small differences they can make at home every day, the cumulative savings will be dramatic - both to their own energy bills and the planet as a whole," he said. Those who want to take part in the programme are required to register at www.simedarby.com/switch. 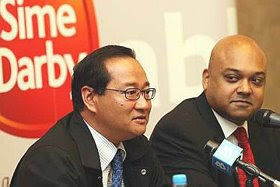 Datuk Tunku Putra Badlishah (left) and Puvan Selvanathan at the launch. KUALA LUMPUR: Sime Darby Property Bhd’s latest Parade of Homes campaign launched in early March has attracted sales worth RM850mil so far, surpassing the combined sales of RM450mil from its previous two home campaigns last year. “Of the 955 new units offered, nearly 70% or 645 units (have been) snapped up by savvy home buyers as of last week,” said managing director Datuk Tunku Putra Badlishah Tunku Annuar. This reflected that home ownership was still a priority despite the current economic slowdown, he told reporters after the launch of Sime Darby’s Switch!, an energy saving initiative yesterday. The latest Parade of Homes campaign, which offers the largest display of properties under Sime Darby’s nine townships, will end on June 15. Tunku Putra said the Switch! energy initiative was targeted at over 10,000 households in townships developed by the property group in Shah Alam, Petaling Jaya, Subang Jaya and Klang whereby each household was encouraged to exchange their old incandescent light bulbs (ordinary light bulbs) for energy-saving (ES) light bulbs. Under phase one, Sime Darby will offer 100,000 ES light bulbs for exchange to its township residents where they could purchase a box of eight ES light bulbs at RM150 from the usual retail price of about RM160. Tunku Putra said the Switch! programme was part of Sime Darby’s corporate social responsibility programme to promote and practise energy efficiency throughout its business operations. “When our residents exchange 100,000 ES bulbs, they are helping to reduce carbon dioxide emissions by 65,000 tonnes,” said Puvan Selvanathan, Sime Darby Property’s chief sustainability officer. It was meant to make things easier. But a change in the law resulted in those in the construction sector having to pay more for the necessary paperwork. "This sweeping change has resulted in construction cost going up by between 1 per cent and 2 per cent," Master Builders Association of Malaysia president Ng Kee Leen told Business Times in an interview recently. Under Budget 2009, the government said it wanted to simplify stamp duty assessment. Industry players, who said they were not consulted, did not object because they thought it would be positive for the sector. However, they found out that under the Stamp Duty Act amendment, there is a 0.5 per cent duty on construction services agreements that don't require collateral. This covers consultancy contracts, operation and maintenance contracts, maintenance contracts and facilities services contracts. The enforcement of the amendment to the Stamp Duty Act 1949 took effect on January 1 2009 by virtue of the Finance Act 2009. This resulted in ordinary service agreement being slapped with 0.5 per cent stamp duty of the total contract value. Prior to this, the stamp duty on an ordinary service agreement was fixed at RM10. "Now, the stamp duty office says the new rate of 0.5 per cent applies to second- and third-tier agreements too. This change of such drastic magnitude is causing serious cashflow constraints on contractors, consultant engineers, quantity surveyors and architects," Ng said. A lot of construction-related contracts that will be carried out this year were negotiated before the law was changed. This means that the extra costs with the new duty rate were not taken into account. The accumulative result of stamping all agreements (including sub-contracts and outsourcing) at 0.5 per cent of contract value is exorbitant. Eventually, these extra but unnecessary costs will be passed on to the government and the public because all construction contracts are either government jobs or packages awarded by property developers in the private sector. Malaysia's contractors have appealed to the government. "We've forwarded a memorandum to Finance Ministry in April and the officials promised to look into the matter. So far, there has yet to be any positive action. Our members cannot afford to wait any longer. Time is running out and we face penalties for late completion of projects," Ng said. Malaysian Institute of Architects president Lee Chor Wah concurred with Ng. "The amendment was supposed to simplify stamp duty assessment but it had increased cost of doing business instead," he said. Already, more than half of its member architects had to take job cuts and pay cuts due to the tough economic climate. SHANGHAI: Dutch financial group ING’s real estate arm has launched a second property fund in China and is targeting to raise US$500 million (US$1 = RM3.48) to US$750 million. The fund will make nine to 10 investments with average deal sizes of US$50 million to US$75 million, Richard van den Berg, China head of ING Real Estate, said. The fund is expected to return 20 per cent or more, he said. The fund will include mainly residential development projects in first- and second-tier Chinese cities, but will also be on the lookout for acquisition opportunities in first-tier cities. Solid: An artist's impression of the facade of the Hard Rock Hotel Penang. HARD Rock Hotel Penang is offering fabulous packages to celebrate its opening come Sept 19. Take a break and soak in the sun during the day, and watch live band performances and party during the night as Hard Rock Hotel Penang promises the ultimate fun-filled vacation for holidaymakers by infusing elements of Rock ’n’ Roll music and entertainment. Featuring a modern structural design with a rockin’ edge and memorabilia from rock stars around the world, the hotel – the first Hard Rock Hotel in Malaysia – is offering an Opening Special Package that starts at RM368++ for Hillview Deluxe and RM418++ for Seaview Deluxe, valid from Sept 19 until Dec 18, 2009. These packages include accommodation for one night, breakfast for two adults and two children (below 12 years old) and a Limited Edition Platinum Record Souvenir. “To celebrate the opening of this hotel, we are offering the Opening Special to allow everyone to walk this journey of entertainment, fun and music with us. It’s more than just a vacation at Hard Rock Hotel Penang,” said Hard Rock Hotel Penang general manager John Primmer. Located at the famous Batu Ferringhi in Penang, Hard Rock Hotel Penang boasts 249 chic rooms and suites with unprecedented view of the hill and sea. All rooms are fully equipped with DVD/CD players, a 32-inch LCD TV, iPod Docking station, Wi-Fi connectivity, IDD telephone, in-room safe, mini bar, hairdryer, coffee- and tea-making facilities and iron and ironing board. For an exceptional dining experience, the hotel features five food & beverage outlets, including the famous Hard Rock Cafe serving authentic American food; Starz Diner, an all-day dining restaurant featuring Asian and International Cuisine; and the Pizzeria by the poolside. To enjoy a chill-out session, relax at The Shack pool bar or at the Lobby Lounge. A wide selection of facilities are also available at the hotel, including the Rock Spa, Lil’ Rock Kids Club, Teens Club, a fully equipped gym, Hard Rock merchandise stores and a 2,416 sq m (26,000 sq ft) free-form swimming pool – the largest swimming pool in Penang. So get ready to rock! For reservations, book online at www.hardrockhotels.net/penang or call the hotel’s toll-free line at 1800-88-ROCK (7625) and request for the Opening Special Package. MALAYSIAN Resources Corp Bhd (MRCB) said it can manage its high debt level and expects to gradually cut it over the next few years as it wins more work and sells more properties. The group's total debt of RM1.6 billion is almost triple its shareholders' equity. MRCB group managing director Shahril Ridza Ridzuan said the high gearing has always been a matter of concern to the group. "We currently have an order book of RM2 billion which should double by year-end and and this can help bring down our gearing to 0.5 times," Shahril told reporters in Kuala Lumpur yesterday after the company's annual general meeting. MRCB chief financial officer Chong Chin Ann said the group's actual gearing is 0.5 times but ballooned to 2.5 times partly due to the Eastern Dispersal Link highway project in Johor Baru and some other office projects. "By excluding the highway project, the debt will come down by RM540 million and will improve our gearing," said Chong. The Eastern Dispersal Link and the Permai Psychiatric Hospital, also in Johor Baru, are worth RM1.2 billion. 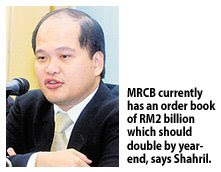 In the first quarter ended March 2009, MRCB which is a builder and one of the country's biggest providers of office space, returned to the black when it made a net profit of RM153,000 compared to a net loss of RM57 million in the whole of last year. Meanwhile, Shahril said the future of MRCB is bright with various projects lined up for completion. This includes Jalan Duta-Ulu Klang Expressway, the Eastern Dispersal Link highway project and a multitude of projects at its flagship Kuala Lumpur Sentral. At Kuala Lumpur Sentral, there are nearly 5 million sq ft of space under development right now in terms of offices, retail and serviced apartments, a new mall and a campus, among others.